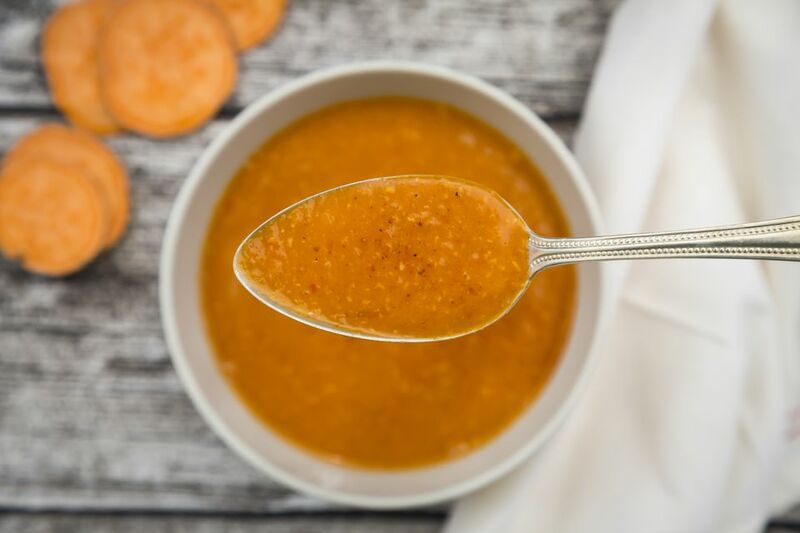 This warming, creamy, nutrient-rich sweet potato cauliflower soup is perfect for fall, and it's hearty enough to make a light meal. Sweet potatoes and carrots give it a beautiful pale orange color, and it keeps well for three to four days when it's refrigerated. Prep all the vegetables, reserving the 2 cups mini cauliflower florets. Heat the olive oil in a large saucepan. Cook the garlic, onion and carrot over medium heat until the onion is translucent, about 8 minutes. Add the sweet potatoes and the large cauliflower chunks, along with the stock, 3 large pinches of sea salt and the bay leaf. Bring to a boil, cover, and lower the heat. Simmer for 30 minutes. Discard the bay leaf. Add the chopped thyme and remove the pan from the heat. Puree with mixture in a vertical blender until it's smooth. Adjust the seasoning and add the reserved cauliflower florets. Return to the soup to medium-low heat and cook until the florets are tender, about an additional 10 minutes. Garnish with chopped parsley or cilantro before serving. You can add a little water or stock if the soup appears too thick after it's pureed. Add 1/2 cup at a time until you've reached the desired consistency without making it too thin. Try roasting the cauliflower, sweet potatoes, garlic, onion and carrots for a variation that brings the sweetness of the vegetables front and center. Just place everything on a baking sheet, drizzle with the olive oil, and roast for 35 to 40 minutes at 400 F or until the vegetables are tender. You can also make this soup in a slow cooker. Add all the ingredients except the garnish and the reserved cauliflower florets to the pot and cook on high for 4 to 5 hours. Then puree the mixture just as you would if you had made the soup on your stovetop. You'll have to finish it off on the stove to tenderize the florets, but this is an excellent alternative if timing is an issue. Instead of the chopped parsley or cilantro, try sprinkling your bowls full of soup with crumbles of cooked bacon and a few shreds of cheddar cheese.